I just love Glenda Millard’s work. Her words never disappoint. The illustrations sound absolutely incredible. Will have to track this book down I think. A fabulous book, that moves like a horse, rhythmically taking the reader on a new adventure on each beautifully created page. 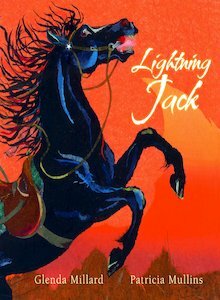 The illustrator’s ‘Lightening Jack’ captures the true essence of a horses beauty and grace.The text reminds me of a Banjo Paterson ballad and cleverly brings in classic Australian characters from our past. I love it and this book has become my favourite and I know i will enjoy it for years to come.I am a ‘Pferdeschwester’!